Some excellent performance from the bowlers helped Bangladesh to restrict Sri Lanka from taking a big lead in the 4th day of Colombo Test. Sri Lanka finished the day with 268 for 8 with a lead of 139 runs. Bangladesh need to pick last two wickets quickly to achieve a memorable win in the 100th Test. Sri Lanka started the day with two overnight batsmen Upul Tharanga and Dimuth Karunaratne. Mehedi Hasan took the only wicket of Tharanga in the morning session. Mustafizur Rahman picked up his first wicket just after the lunch and dismissed Kusal Mendis on 36. Couple of overs later he struck again and got rid of Chandimal on 5. Soon Shakib Al Hasan joined the party and trapped Gunaratne lbw on 7. 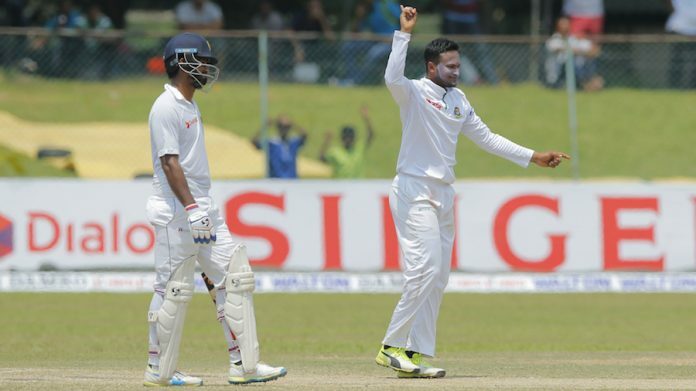 Dhananjaya de Silva was the next man to be dismissed by Mustafizur without scoring any runs. Before tea, Shakib struck again and dismissed Niroshan Dickwella on 5. Mushfiqur Rahim took a stunning catch. Karunaratne scored a century before got rid of by Shakib. Then Taijul struck to dismiss Herath after tea. Perera and Lakmal are unbeaten at the end of the day.